I finally got Zeb's newer booster board set. I'm just looking for pics on how you guys have yours secured to your cab as well as how you have it wired. Thanks guys. That gives me more info to go off of. 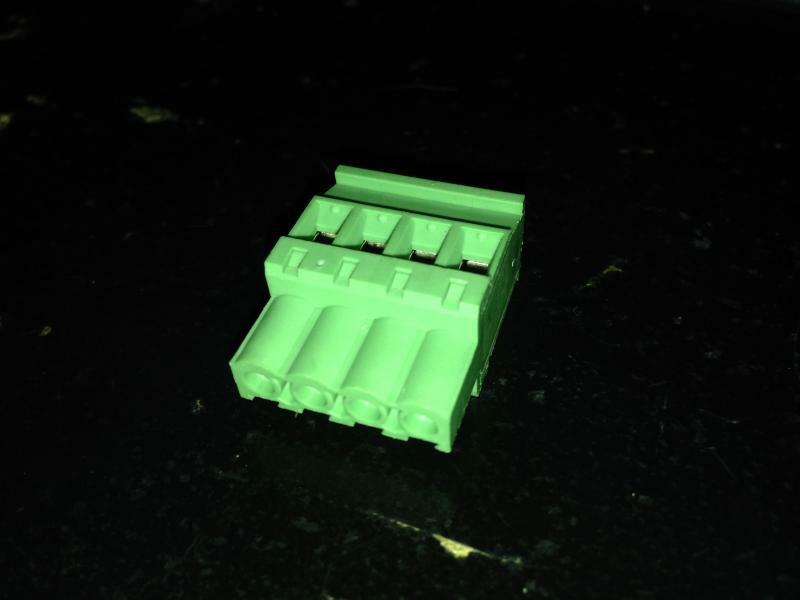 Anyone happen to know the technical term for these terminals that come with the boards? I seem to be 1 short as the power connector from the bottom to top. I'd like to order some more for another project that I'm working on. These boards do handle 24v, right? If I don't need it; I'd love to be able to get rid of my 24v power supply that runs my contactors. To be honest....I never ground the controller to the boards when I test them and it works fine, being as all of the grounds for the power supply come from the one source. It was an issue when people were using multiple power supplies, occasionally a ground wouldn't complete in a circuit. I switched to that connector as a "blanl out" so that people wouldn't try jumping from the bottom to the top as the 3.3v isn't fed into the upper board anymore but rather, is regulated by the onbaord circuitry from the 5v feed. I was thinking I needed to wire the power from bottom to top also because the Inductor board instructions gave the wiring diagram for just that purpose. What I'm seeing in your photos is you can just use a spare power output from your ATX power supply to provide voltage to the upper board. 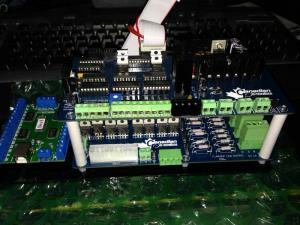 Yes, the boards do all of the voltage conversion necessary for the various components (including 24v for the contactors). One ATX computer power supply is all you need...so yes, you can ditch your dedicated 24v supply. I don't have a pic atm, but I attached mine to a plank of wood, then screwed that plank into the side of my cab, about in the middle of the left side. That way I can reach it by lifting up the screen. Ok, I've started wiring up the new boards... I have the gear/shaker combo from Zeb. I've got a question about wiring them to the v2 boards. From the gear/shaker board they share the same + line. The v2 boards have separate pwr (+) input next to both the gear and another for the shaker. 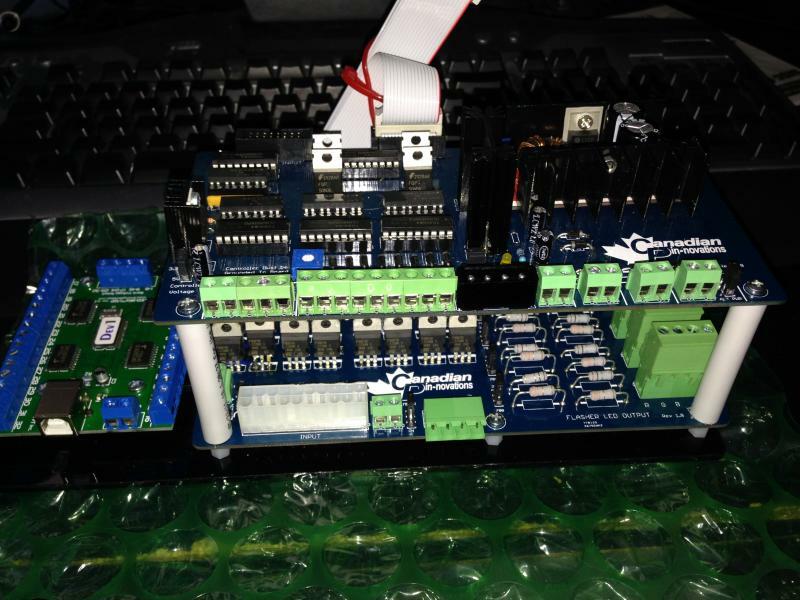 Do I have to split the + and run a wire to both the shaker and the gear inputs on the v2 boards? Or can I just plug the + wire into one or the other? Also, my contractors already have 1N4007 diodes installed inside them. The v2 boards already have these, do I need to remove the ones from inside my contactors? Or is it OK if I leave them there? Will leaving them inside the contactors cause any problems? One more thing... Where or how would I setup RGB flipper buttons? You only need to connect the shaker motor molex plug to an appropriate connector from the power supply and run the shaker and gear (-) leads to the appropriate terminals on the boards. The extra diodes won't affect anything, it's all good. Run the rgb flipper leads directly from the outputs on the ledwiz. You can use the unused connections for the contactors, strobe, spare or front panel lights. Whichever ones you like. Anyone know where to purchase Zeb's Boards PWM and motor/inductor boards.